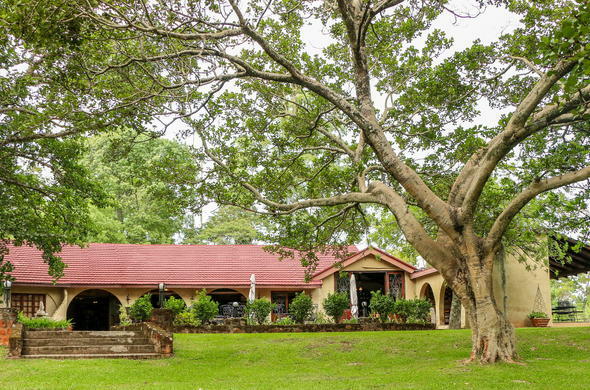 Bohm's Zeederberg Country House, a country hotel in Mpumalanga, is an intimate and friendly home from home in the Sabie River Valley. In the beautiful setting of the Sabie Valley and Hazyview in Mpumalanga, amid majestic mountains and verdant forests, Bohm's Zeederberg Country House is ideal for complete relaxation in the country, a mere 4.5 hours drive from Johannesburg. Guests are accommodated in delightful chalets set in lush gardens and rolling lawns. Each has a secluded veranda with superb views of the Sabie River Valley. The sparkling pool is inviting after a delightful walk in the surrounding countryside, guaranteed to work up an appetite for the excellent cuisine offered by Marlene Bohm and her family. Bohms Zeederberg Country House is a perfect base from which to explore an area rich in natural beauty. Visit quaint Pilgrim's Rest, the breathtaking Blyde River Canyon or the lovely waterfalls of the Sabie Valley. In addition, this country hotel in Mpumalanga is ideal for self-drive game viewing in the Kruger National Park, as well as early morning safaris, river rafting and horse riding.